A natural wonder of the world, the unrivalled beauty of Flores and its remarkable topography is famed amongst travellers and photographers. The spider-web rice fields of Cancar, near Ruteng, and the verdant terraced rice paddies of Lembor Village are some of the most iconic and photographed images of Flores. Using traditional farming methods, the rice paddies of Lembor and the spider-web rice fields of Cancar are cultivated in stunning and intricate patterns, creating spectacular aerial views. Their distinctive spider-web design is more than just an inspiring panorama, as this age-old system is vital to communal farming practices, with each segment of the paddy or spider-web belonging to a different family from within the village. Rice is one of the world’s most important farmed commodities, with Asian countries responsible for the majority of global rice production. Seasons of immense rainfall and warm temperatures, without the sudden cold weather, make Asia the perfect tropical climate for mass rice production. Indonesia is one of the top five rice producers in the world, and also one of the largest consumers of rice domestically, with the average Indonesian eating 150kg of rice per year. 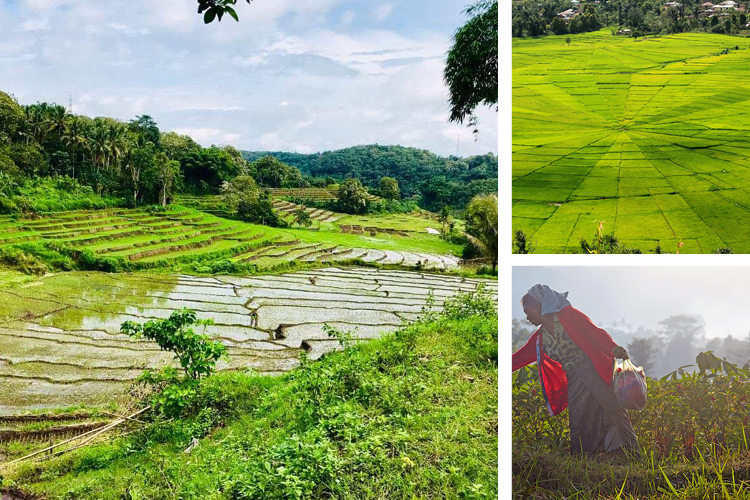 The majority of Indonesia’s rice is produced in small local holdings, rather than large corporations, due to employment, labour costs, and traditional village ways of life. Heavy manual labour is needed for farming and harvesting rice, with much of this work undertaken by villagers, who typically earn low wages, leading to poor living conditions, and without access to healthcare or education. However with domestic demand outstripping supply, currently, Indonesia must import rice from other countries to meet the market demand for rice. Thus local farmers are working hard, but with little to show for it. The Indonesian government believes that a possible solution may be the re-introduction of traditional methods of rice production, leading to greater self-sufficiency, a reduction in import costs and the potential to increase export costs, which would be of great benefit to the people of Indonesia. It is hoped that a return to these traditions may allow villagers to become self-sufficient rice producers, both providing for their village and producing enough for export, creating vital industry and income for the villagers. Farming practices are more broadly evolving with the growing awareness about the damaging environmental impact of previous methods. In the 70’s for example, the widespread global use of artificial pesticides and fertilizers to increase rice production, had a devastating impact on the environment. Soil degradation, tainted water supplies and negative health outcomes for the local people prompted farmers to stop using these harmful chemicals. Instead, the government is now researching technical innovations and subsidizing safe fertilisers to encourage sustainable farming and healthier agricultural practices. This is not the first time that Indonesia, and indeed the world, has needed to work hard to rectify the damage caused through past destructive measures. For example dynamite fishing, once favoured for its immediate results, led to catastrophic damage to coral reefs and severely depleted fish stocks. The reefs and oceans are now recovering with time, and greater awareness around more sustainable fishing methods to protect the ocean and meet the demand for fish with sustainable and regulated practices.